If you would like to place your refill order by telephone, contact us during business hours with your prescription number. Call us at 1-877-627-8633. 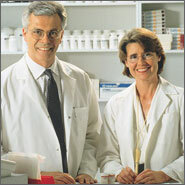 Add your medication to a price quote. Click on the button and complete the remaining online form. Use the online form below. The form below does not provide a field to enter your price. Your refill will be based on our current price list. Please complete the online form for your refill request. All patients receiving prescriptions from a Manitoba pharmacy have the right to receive patient counselling. When would be a convenient time for our pharmacist to contact you? Select one below. Anytime during the day at work. Anytime during the day at home. Please do not contact me as I have taken this medication before and do not wish to receive patient counselling. In our continuing efforts to save you money, we will automatically substitute for generic products where applicable unless specifically requested not to. Number of tablets capsules, mls, etc. I understand that our dispensing pharmacy will fill to the nearest whole bottle quantity when required. Please be sure all information is entered correct. A representative will contact you only there are any problems with your refill request. Please allow up to 21 days for the delivery of your order. We will use the payment information that we have in your file. If there has been a change in your payment information, please contact us.